Aftab Ahmad Blog Kashmir - Amend Armed Forces Act, Why Not Use Rubber Bullets? Kashmir - Amend Armed Forces Act, Why Not Use Rubber Bullets? When the prime minister of India refers to the alienation of a state, delivers a televised address in the language of the region and promises autonomy, the seriousness of the situation is not in doubt. Yet, if the run up to these conciliatory gestures is considered, there is little evidence of the Indian government's willingness to make a special effort to conquer hearts and minds. Instead, what was seen in Srinagar and elsewhere in Jammu and Kashmir in the last few weeks was an unusually harsh police response to stone-throwing crowds. In fact, from the way the government both in the state and at the centre behaved, it appeared that they regarded the situation purely in terms of a law and order problem, which had to be controlled with a heavy hand. Hence the distressingly high numbers of young people who were killed in police firing. There was no doubt that the rising toll added fuel to fire and made the government's task increasingly difficult. The latest offers from Prime Minister Manmohan Singh are an admission that the earlier dependence only on the security forces to restore order was wrong. But this hot-and-cold approach also shows that the government hasn't evolved a viable policy to deal with the problem. As a result, the Kashmir issue remains 'live' and a source of encouragement to Pakistan and Pakistan-backed separatists in the valley. However, there is nothing new or surprising about New Delhi's inability to make up its mind on how to deal with the problem. When the ruthless police measures fail, it turns to conciliation. And when attempts at providing a healing touch do not yield the desired result, there is a return to the use of tear gas, baton charge and firing. This switching back and forth between a 'quiet dialogue' and intimidating flag marches by the army is a recipe for stagnation. Although successive prime ministers have shown a willingness to walk the extra mile for the sake of peace, their initiatives have been fruitless because of the lack of sincerity in implementation. Before Manmohan Singh, his predecessor Atal Bihari Vajpayee had promised to meet the demands of locals within the parameters of 'insaniyat', or humanity, underlining a unique openness of approach which was not restricted by constitutional parameters. Considering that the Bharatiya Janata Party (BJP), to which Vajpayee belongs, prefers a hardline where Kashmir is concerned - demanding even an abrogation of Article 370 of the Indian constitution conferring special status on the state - he demonstrated remarkable flexibility. Yet, when it came down to concrete action, his government rejected the proposals for autonomy made by the National Conference and passed by the state assembly in the year 2000. The same subject has again come to the fore with Manmohan Singh referring to the possibility of granting autonomy. But since he refused to spell out the details, the proposal can already be seen as a dead letter in view of the unpropitious background. In any event, the earlier moves to call the governor sadr-e-riyasat or the chief minister wazir-e-azam are no longer feasible. The alienation of the common man has become too deep and the separatists have become too entrenched for such cosmetic measures to succeed. Besides, the BJP will raise such a hue and cry over the use of such Muslim nomenclature that the atmosphere will become charged with communal tension even outside Kashmir. Nor is there much chance of the so-called skill development mission succeeding in creating jobs in the near future to lure youth away from throwing stones at police vehicles and outposts. What is needed instead are several immediate steps which will show a genuineness of intent on New Delhi's part. One of these is to ban the use of live ammunition in controlling crowds. Indeed, this is a step which is overdue not only in Kashmir but all over the country. 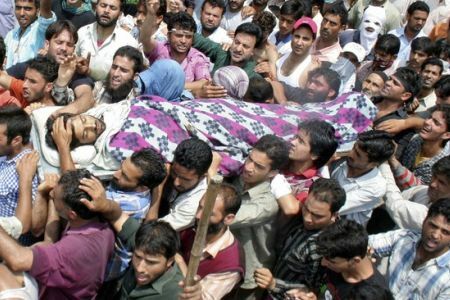 If there was any lesson for the guardians of law and order from the Kashmir disturbances, it was that the deaths of young people, especially of innocent passersby as in the case of the youth who was hit by a teargas shell, exacerbated the situation. The deaths in no way prevented the young men, and even women, from coming out on the streets to face and provoke police. The switch to rubber bullets to disperse riotous mobs can be a crucial step in this situation. It will not only bring down casualties but also show the government's desire for conciliation. The move will also act as an antidote to the possible brutalisation of security forces, who have a thankless task in dealing with angry protesters day after day. A greater use of water cannons is another way to cool tempers. The other step which can help the government reach out more effectively to the ordinary people is an amendment of the Armed Forces (Special Powers) Act or a restriction of its application in Kashmir. Considering that Home Minister P. Chidambaram has said the suggestions for the dilution of the act cannot be 'brushed aside', there is evidently a growing awareness in the government that the draconian measure has become counter-productive. The time for promises is over. The only way tangible gains can be made in Kashmir is through concrete, ameliorative action.